Ian McCoshen will be entering his third season with the Waterloo Black Hawks in the United States Hockey League in 2012-13. The 6-foot-3, 205-pound McCoshen, regarded as one of the top draft eligible prospects for the 2013 NHL Draft, has produced eight goals and 26 points in 97 career games in the USHL. Waterloo is representing the USHL in the 2012 Junior Club World Cup tournament from Aug. 18-26 in Omsk, Russia. McCoshen, 17, has agreed to take the time and maintain a blog for NHL.com that will chronicle his stay in Russia both on and off the ice. 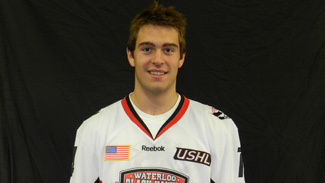 My name is Ian McCoshen and I play defense for the Waterloo Black Hawks in the USHL. Thanks to NHL.com for giving me the chance to share my experiences as our team prepares for the upcoming season with our big trip to Russia for the 2012 Junior Club World Cup. I first came to Waterloo when I was 15 years old and have enjoyed every moment of my time here. Not too many guys can say they played three seasons in the USHL and I have a unique opportunity to again be part of such an outstanding league. I am looking forward to this season ahead of us because we have a good team with a great group of guys and I'm really excited about what we can do. Our team came up just one game short of winning the Clark Cup last season and it took me a couple months to get over that feeling of being so close to a championship. It was tough to get to sleep at night with that weighing on my mind, but it gives me even more motivation heading into this season. The NHL Draft is something I have dreamed of ever since I was a little kid playing hockey. It is an honor to hear my name mentioned among many of the top prospects out there, but I just want to work hard this season to see what I can do, help the team win games, and the draft stuff will fall into place down the road. I feel very fortunate to be in the spot that I am right now and I wouldn't be here if it weren't for all the coaches that have helped me along the way. Being a part of the 2012 Junior Club World Cup is an unbelievable experience. We get to represent Waterloo, the USHL, and the United States – and that is pretty cool. The travel was definitely an interesting experience as this will be the longest road trip in USHL history. From the time we left the rink in Waterloo to the time we got to the hotel in Moscow, it took more than 24 hours. I tried not to sleep too much on the plane so I can sleep better tonight. We will see how well our bodies function with a nine-hour time zone difference from back home. This trip is probably the best opportunity we could have to really cement our bond as teammates heading into the season. For the next 15 days, we are always going to be with each other and this is incredible for us. Check back often and thanks for reading!